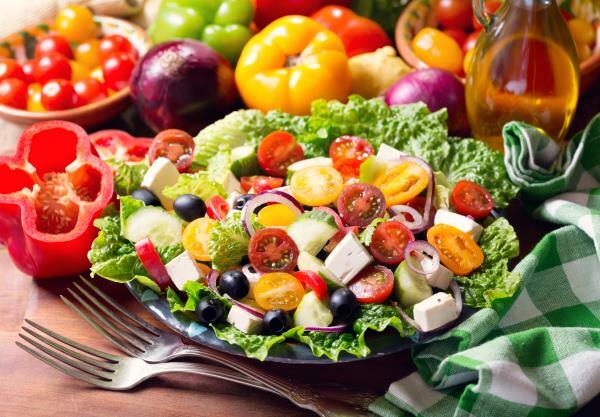 Eating a Rainbow Diet, a colorful Mediterranean Diet, can increase the good bacteria in your gut by 7%, when compared with the standard Western diet, according to scientists at Wake Forest Baptist Medical Center. In particular the Rainbow Diet particularly increased strains of the species Lactobacillus, known to increase acidity in the gut and restrict pathogens. Other strains of this species, like L. rhamnosus, are known to heal the holes in leaky gut syndrome. The study was led by Hariom Yadav, Ph.D., assistant professor of molecular medicine and microbiology and immunology, who used animals rather than humans because the data was more accurate. Human studies tend to rely on self-administered diet records, and people are not thorough in these. Researchers took non-human primates, which were randomized to either Western or Mediterranean diets. and followed for 30 months. The Mediterranean diet consisted of fish oil, olive oil, fish meal, butter, eggs, black and garbanzo bean flour, wheat flour, vegetable juice, fruit puree and sucrose. cholesterol, high-fructose corn syrup and sucrose. Get to grips with the Rainbow Diet once and for all. And see exactly why is is the healthiest diet of all. The diets had the same number of calories. The benefits of the Mediterranean diet on stool analysis were clear. Levels of good bacteria (commensal bacteria) received a significant lift. And this first increases the strength of the immune response. Researchers said that the results had huge implications for the treatment of chronic illnesses like diabetes, heart disease, cancer and even brain diseases.